Hall of Fire begins chatting The Hobbit today! It’s one of literature’s most famous opening lines. The hobbit Bilbo Baggins is smoking a pipe and minding his own business when Gandalf the wizard arrives, offering adventure. Bilbo, comfortable in his Bag End home, isn’t keen on anything remotely adventurous. But fate has other ideas. The very next day Bilbo — and without so much as a pocket handkerchief — is off on a grand adventure in the company of Gandalf, and 13 dwarves keen to avenge their forefathers against the dragon, Smaug. 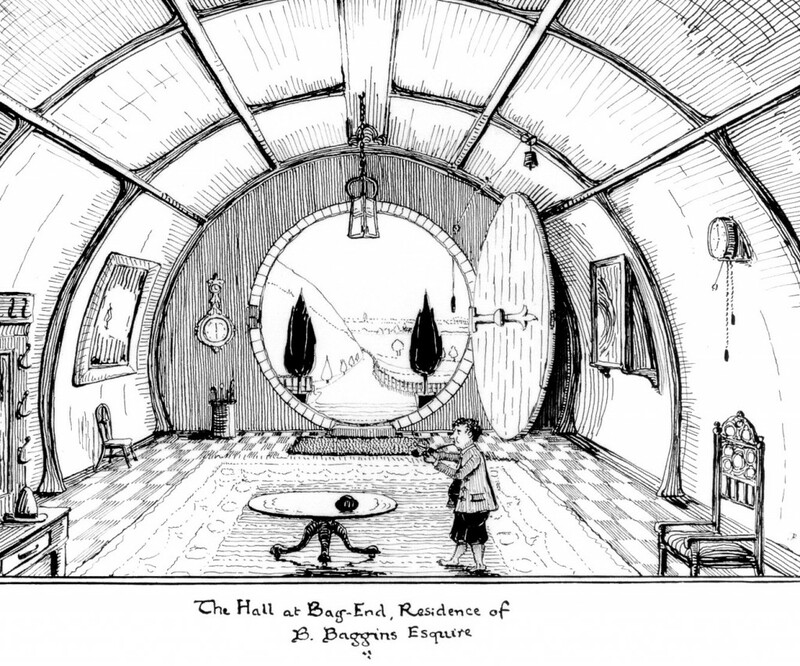 Having just concluded an extended (and extensive) analysis of The Lord of the Rings, Hall of Fire is now embarking on a series of book-based Hobbit chats over coming weekends that will delve into Tolkien’s text chapter-by-chapter. Join us tomorrow on Saturday January 10 at 5pm EST in #thehalloffire in our IRC chatrooms where we’ll delve into the first chapter “An Unexpected Party” and discuss the nature of Hobbits and their customs, Bilbo’s near-disastrous tea party and our initial impression of the Dwarves and Gandalf. Not sure what time the chat will be where you are? Check this little conversion table out for some help. Alternatively, check our handy Event Announcer over on Time and Date for the correct time in your area. Our chats usually last from an hour to ninety minutes, and are very newbie friendly. Simply drop in and join the conversation! However, our main room, #theonering.net is open 24 hours a day. We don’t always talk Tolkien there, but if you have a burning question, you’ll usually find one or two of “the regulars” up for a chat! Chat happens on #thehalloffire on irc.theonering.net — the TORn IRC server. It is based on internet relay chat technology (that means it’s hella old skool). It’s a text-only, moderated chat room full of eccentric Tolkien fans. We’re open 24/7 (although some times are busier and more active than others). If you’re more oldschool or technically adept, you can install one of the scores of standalone chat clients that available for desktop and mobile devices. Just plug in our server details (see bottom) into the client and connect. TORn One Last Party campaign hits $136,000 with just 9 days to go! Our One Last Party fundraiser on Indiegogo has now raised more than $136,000 — 76% of our goal! — and we’re moving ever-closer to success! If you’d like to join us as a Party of Special Magnificence in Hollywood in February — a toast to all SIX Middle-earth movies, now is the time to pledge to our party campaign. Even if you can’t make it to Hollywood (or if you’ve already contributed), you can help out by retweeting or sharing our fundraiser across social media. As well, all pledges will go into our draw for this amazing Smaug dragon bodice (just click here to have a look at what you could win), that has been generously donated by Marie Porter Costuming. It’s a high quality latex bodice, sculpted and hand painted by me, featuring a wired “skeleton” to allow for wearer customization of size, shape, and cup shape/coverage – it’s a highly adjustable top, and will fit anywhere between a ladies XS to Medium, and up to a DD cup size. (DDD for those in the XS size range). Includes adjustable clear bra straps. So if that takes your fancy, or if you’ve been pondering getting that amazing Movie Guide signed by SIX cast members (Thrain perk), or snagging the poster with TWELVE signatures (and which INCLUDES a VIP ticket – Gimli perk), then now is the moment to pledge!